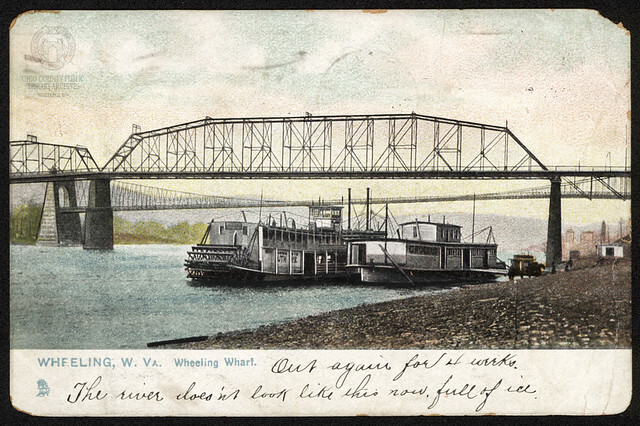 Twenty-thousand people attended the opening of the Steel Bridge in October 1891, many crossing and re-crossing the 1,819-foot span the Wheeling Intelligencer hailed as “a specimen of enterprise and progressive spirit.” The city promised Island residents that the new structure, unlike the Suspension Bridge, would not have pedestrian tolls. The promise was not kept—it also cost a penny to cross. Street cars also made use of the bridge, which was demolished in 1962. DEMOLISHED (1891-1962): Spanned the Ohio River from Alley 7 in Downtown Wheeling to Ohio Street on Wheeling Island. ▶ Vertical File: Steel Bridge, Wheeling Room, non-circulating, ask for access at the reference desk. ▶ Archives Vertical File: Steel Bridge (photographs), please call 304-232-0244 to make an appointment or ask at reference desk.